“At the beginning of October I travelled up to Bangor in Wales to speak at the Readers’ Day in the Cathedral there. The theme for the Day was: ‘A Rule of Life: Providing focus and freedom’ and I had been invited by our Oblate, the Revd Susan Blagden, who is the Training Officer for the Diocese. I had never been to this part of Wales before and hadn’t realised I would be entering a foreign land where Welsh is spoken equally with English! Bangor is, of course, on the Menai Straits with the Welsh Mountains as a backdrop – so it is a very pretty part of the world. 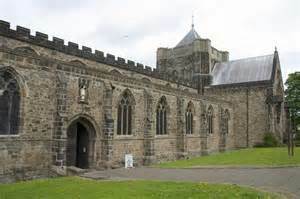 The Cathedral, too, has very ancient foundations – reaching back to the sixth century when St Deiniol become the first Bishop of Bangor. I found the people very welcoming and the theme of a Rule of Life was appreciated and gave ongoing food for reflection. The Day ended with a Eucharist at which the Bishop presided and preached and at which Lay Readers were both newly commissioned and re-commissioned. It felt a very good Day and I was very pleased to be a part of it”.